Olympic National Park, made a National Park by Theodore Roosevelt in 1938, is a Unesco World Heritage Site. 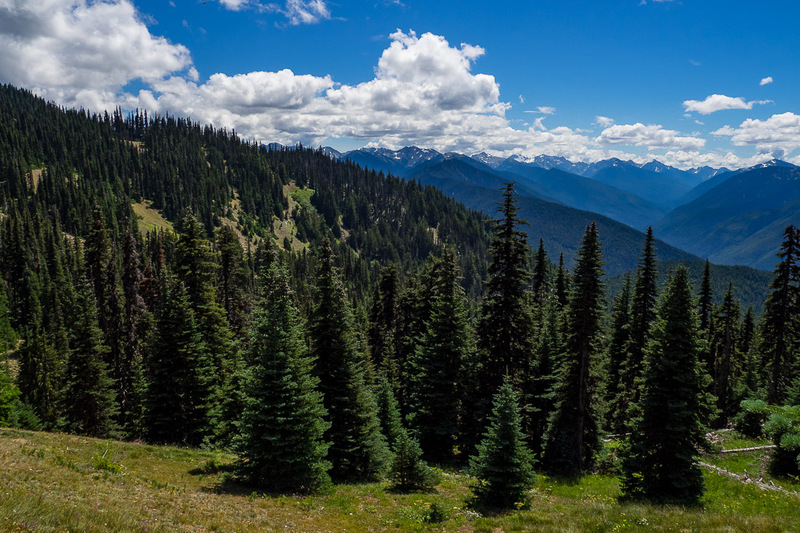 The park has four basic regions: the Pacific coastline in the west and the Juan de Fuca Strait in the north, at the alpine areas of the Olympic Mountains, the rainforests on the temperate west side and the lush forests of the drier east side. From Port Angeles in the north a road leads up to the Olympic Mountains whose sides and ridgelines are topped with massive glaciers. 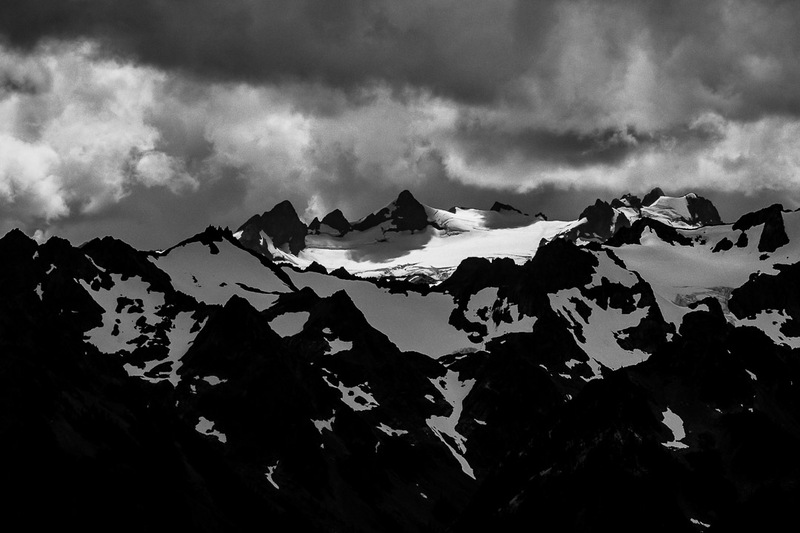 Mount Olympus, which rises to 7,965 feet (2,428 m), receives large amounts of snow, and has the greatest glaciation of any non-volcanic peak in the lower 48 states outside of the North Cascades. From the Hurricane Ridge Visitor Center we hiked up Hurricane Hill for stunning views of Mount Olympus on one side and a view down to the sea fog covered Juan de Fuca Strait and Canadian Vancouver Island visible behind. The evening we spent at Lake Crescent, a beautiful mountain lake just west of Port Angeles. 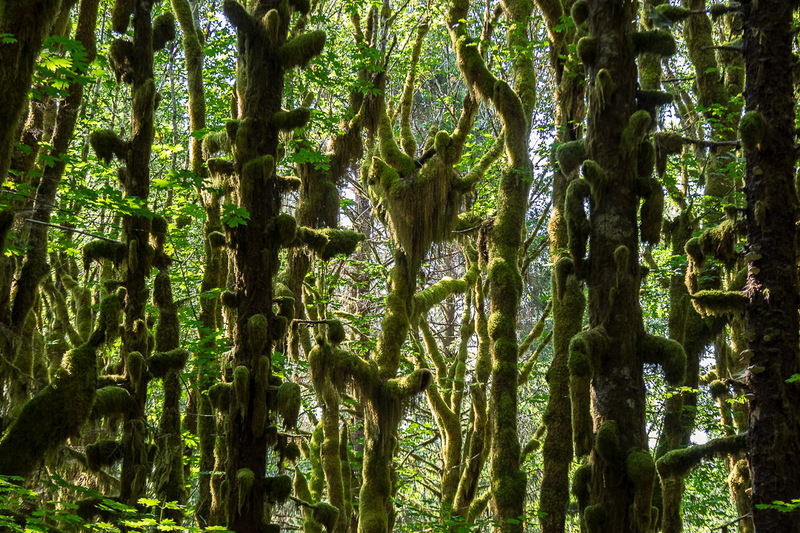 The next day, enroute to Kalaloch, we visited the fascinating Hoh Rainforest. 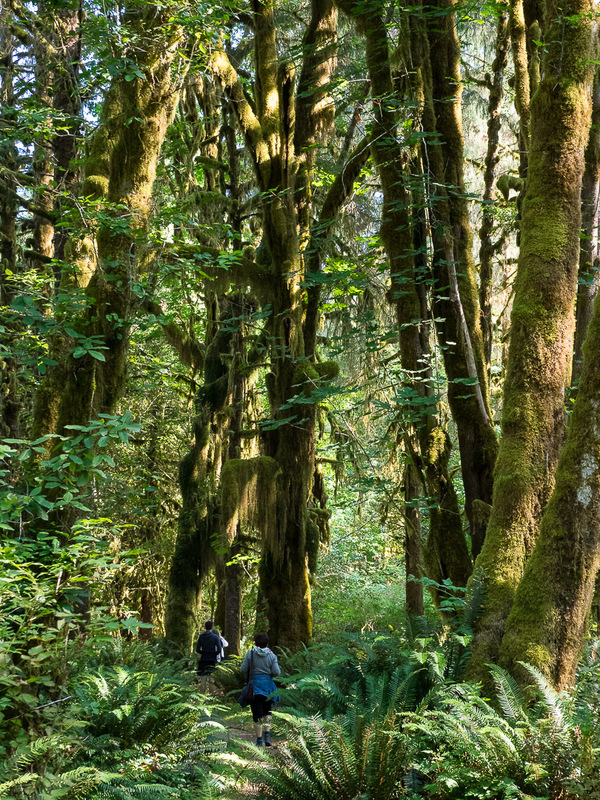 As the other rainforests that mantle the western side of the park, is mantled by temperate rainforests, which receive annual precipitation of about 150 inches (380 cm), making this perhaps the wettest area in the continental United States. 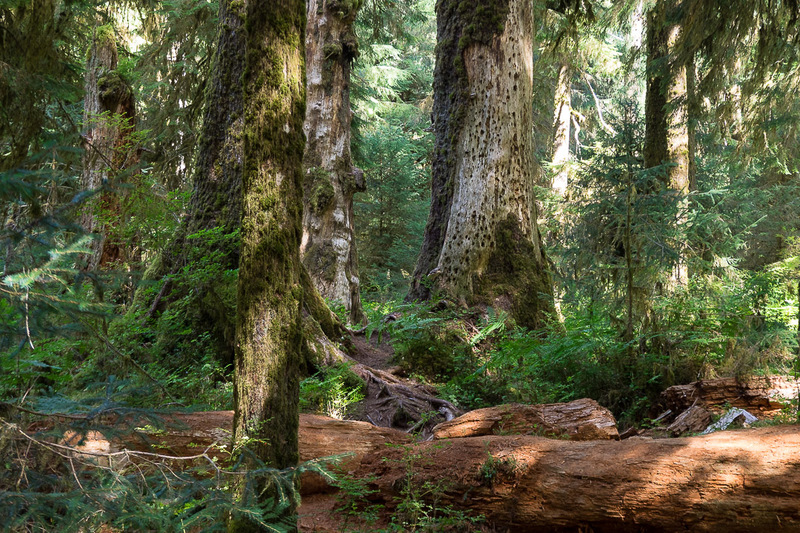 As opposed to tropical rainforests, the rainforests of the Pacific Northwest are dominated by coniferous trees, including Sitka Spruce, Western Hemlock, Coast Douglas-fir and Western Red Cedar. Mosses coat the bark of these trees and even drip down from their branches in green, moist tendrils. The ground is mostly covered by ferns. Walking through it is almost an outer worldly experience. The next day, from Kalaloch, we also hiked through the Quinault Rainforest. It was very tough to photograph in the forest, partly due to the fact that the sun was shining and led to big contrasts that the sensor had trouble capturing. Also, the the size and depth of the trees cape was very difficult to capture in an two-dimensional image, but I hope the posted photos can give you an impression about the beauty of this enchanted forest. 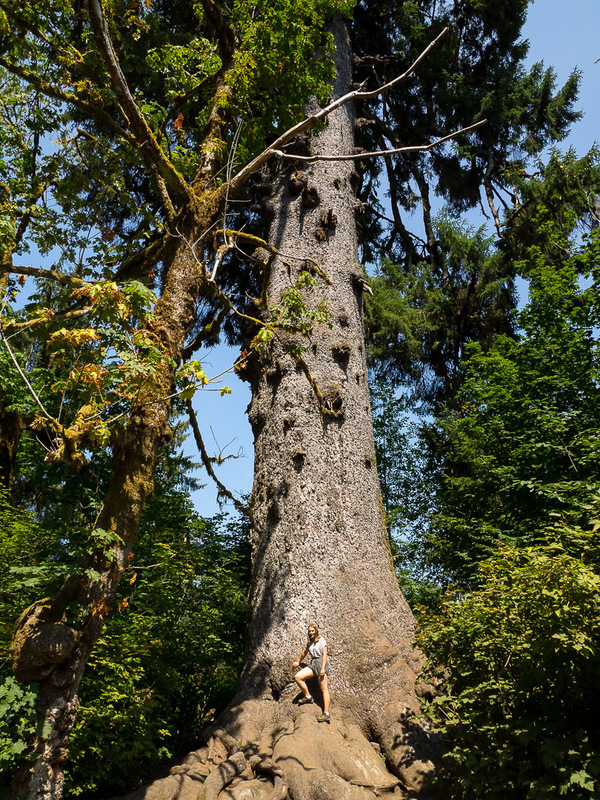 Leaving Quinault, we stopped at the world’s largest Sitka Spruce, where Big Girl in comparison to this 1000 year old tree isn’t all that big anymore. 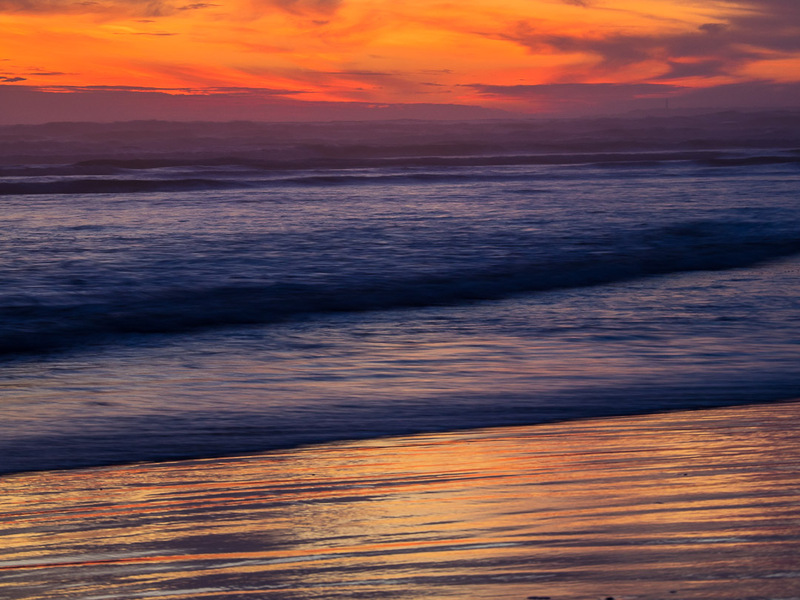 The visit to the Olympic Peninsula was capped by a splendid sunset at Kalaloch Beach. 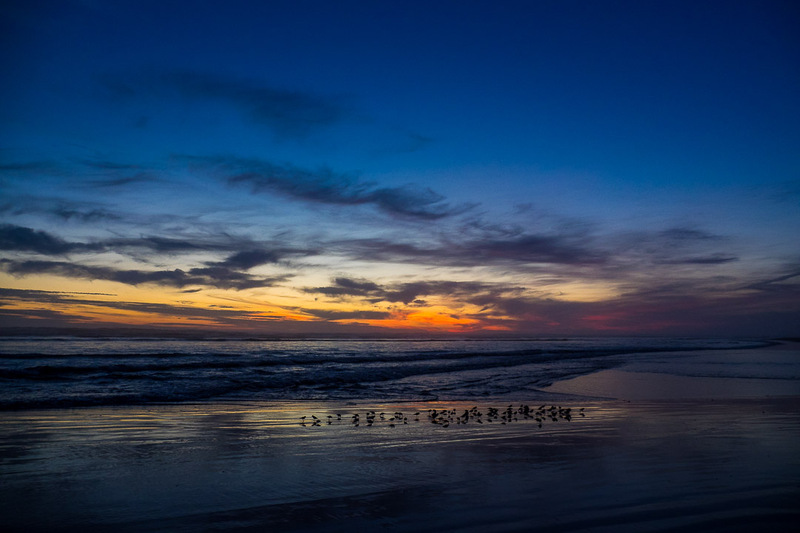 Actually, the half hour after the sun went down behind the crashing waves was a symphony of color. Images shot with the Olympus OM-D E-M1 with the 12-100mm F/4 and the PEN-F with the 40-150mm F/2.8. RAW conversion and post processing in Lightroom Classic CC. That forest looks quite magical and those sunsets so peaceful! Thanks Amy! It really was like walking through the steps of a fantasy movie! Until I saw big girl I had no appreciation for how large that tree was. Wonderful photos. Always interesting to see how a visitor sees the area I have lived in my whole life. Too bad you weren’t able to get into the heart of the Park. Maybe next time. Great shots, just the same. Fabulous photos and what a great trip you’ve had. some stunning shots! 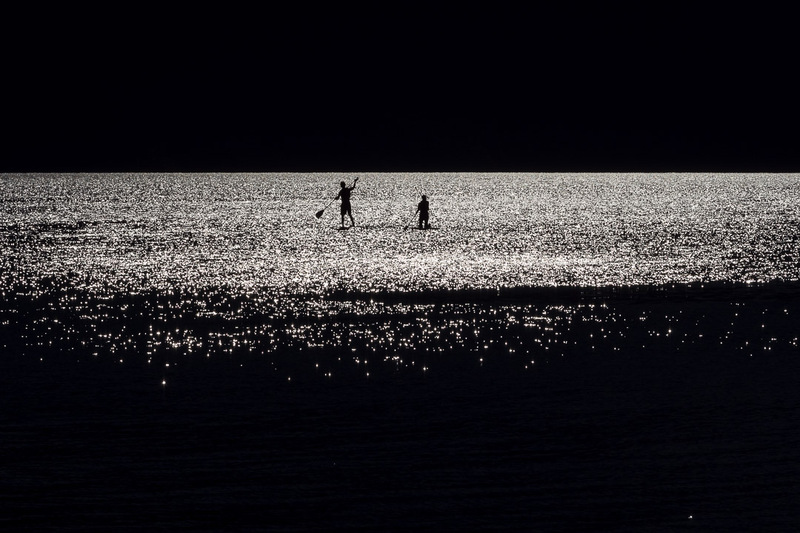 The lake shot in monochrome and sunset pictures are awesome, Marcus! You changed your ISO throughout your picture-taking? I am learning, Marcus, so pardon the simple question. Thank you! No worries, Lois, keep those questions coming! I shoot mostly on AUTO ISO capped at 1600, so the camera selects the ISO depending on aperture and shutter speed. This is why the ISO varies. ISO 1600 gives me still great IQ without much noise, so I don’t have to worry about it. Especially when shooting in the streets. In landscape images, I do dial in the ISO manually, limiting it to 400, which is still noise free in my Olympus cams. Marcus–thanks so much. This was most helpful! Did you use an ND filter for the waterfall shot? No, 1/4 sec and a f/14 did the trick, as the forest was kind of dark. And my Olympus let’s me shoot 1/4 sec hand held without problem, so I didn’t even need a trip-pod! That’s something I wish I could do with my G7. Instead of in body stabilization I got 4K video. It was a trade off. 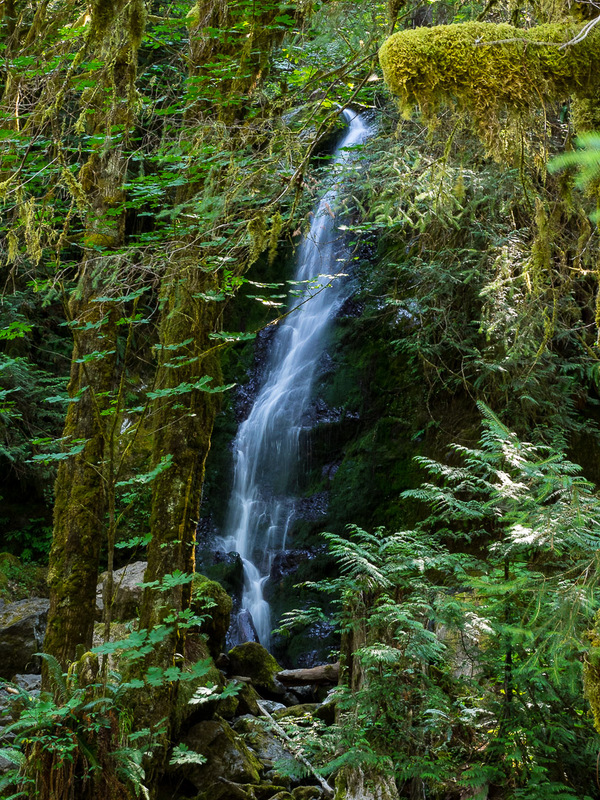 The Olympic peninsula seems to have everything from mountainous glaciers to beaches, with everything in between. The above shots are superb, as usual for you. Despite the difficulty, the photographs taken in the forest turned out excellent. Well captured! Beautiful pics of a fantastic region. I envy you. Beautiful captures of the mountains, Marcus!